Rated 5 out of 5 by FORTUNATUS from Would enjoy more along this theme Though the period-themed games may becoming a bit 'tired' in their commonality, the storyline was a bit different from the recent 'norm, and, therefore, a welcomed change, indeed. Surprised I overlooked the CE when it first appeared, yet a definite buy based on the Demo... Nicely done! Thumbs up! Rated 5 out of 5 by pennmom36 from THE COST OF A LOVE TRIANGLE! Hugo's wife wasn't to happy to learn of the affair Hugo was having with the beautiful flamingo dancer, Esmeralda and her husband vowed to put an end to the affair as well. Now Hugo has been murdered. Were either of them involved? It's up to you and your assistant to solve this love triangle/square and you will get plenty of help from Hugo's pet fox as well! This SE is still a very good game although only the CE allows you to earn trophies and has bonus content. There are 3 levels of difficulty and a very helpful tutorial if you are new to this type of adventure game. The graphics are the same as the other Grim Facades, colorful pastels with lot's of tasks and mini games such as playing the correct notes of the piano keys as shown on the sheet music, and because there are no achievements you can always choose to skip the mini games. The hint system recharges fairly quickly, but you must find hidden fans throughout the game as well as in the HOS, to get extra hints. You will also find coins that you will use in the general store to purchase items to help you investigate. The HOS are slightly interactive, such as clicking on the doors to open and find more items, Some of the items are small and because of the washed out pastel graphics some items can be a little difficult to find, but don't forget to look for the hidden fans for more hints. Most of the items you find are used quickly and within that scene, but it's pretty easy to decide what the items will be used for. I think this is a good game to use a credit or to pay for. Rated 5 out of 5 by JustTheFacts from Beautifully Done - As Always BASED ON FULL HOUR TRIAL ONLY A typical ERS/Grim Facade game, this one is all they always are (which is a good thing, for the most part): Gorgeous, washed out art, crisp and clean, imaginative. Fun junkpiles for HOS, silhouette and lists. We still get to collect those gorgeous fans that I love so much, and coins for the latest suspiciously similar shopkeeper. Music is good, better than usual, because there is a noticeable spanish flavour to it. VOs still include that female actor whose melodramatic voice and delivery I have never been able to tolerate. Unfortunately. Puzzles are about my level of competence which means, I probably won't miss the SG on this one. But things have changed since the last Grim Facade. Somehow we have acquired psychic visions. Which changes everything. How will they affect our investigations? Will bring us closer to killer and therefore more at risk? And we have also got ourselves a cute assistant (well, yeah, okay, the furry critter is cute too). So it appears things are looking up for 'detective'. I can say nothing for the story so far. It's standard fare, and it is too early to know just where our investigations will take us. But I'm anxious to find out! Rated 5 out of 5 by bishky from Lots of FUN!! I really enjoy the Grim Facade series. They are not the most difficult games to play, but they are well drawn and the music is pleasant. The story line flows along and is fairly easy to follow. Some things you have to remember are: pick up all the fans for hints if you need to and move your cursor all over the scenes to find everything (little tiny pieces) that are left about. The cut scenes can be skipped easily. I just like these games because when you are done with an area you will know it as your cursor will not activate. The game flows and there is not a whole lot of back and forth (some but not much). I don't give a blow by blow of the game, as it is done so much better than I could by another reviewer. These games are just fun to play (any level of skill) and I know you will enjoy yourself. I certainly will!! Rated 5 out of 5 by Sere82 from Loved it! excellent and intriguing storyline,with a really charming spanish setting! Very nice graphics, good soundtrack, many different beautiful locations to explore, great HOS and funny minigames, even if on the easy side..You also have the help of the sweet little fox... The main game took me 4,5 hours to complete in expert mode (hint and skip button available, you can change it while playing) and ends conclusively..The CE i played offered a bonus chapter, (more or less 1 hour of gameplay), interesting and almost totally in new areas and with a different surprising conclusion but no collectibles and trophies earned only playing the Trivia (not during the adventure).. If you can live without music and wallpapers I absolutely recommend this SE..if you want something different this is the perfect game to buy! Rated 4 out of 5 by hermitcave from A murder, four suspects, mired relationships, illicit affair, jealousy and a playful fox Through a second story window, the struggle between two men plays out to the night with a brutal stabbing and a badly limping man shuffling from the scene passing on the street beneath the window just as the room explodes. The phone rings and a hysterical woman frantically tells you that her husband has been murdered and the police have been no help and she wants you to find the murderer. You, a detective, and your new assistant, Aidan, arrive at the home of Hugo and Gabriella Sanchez. As the police are still at the crime scene, you decide to talk to the murdered man's wife, Gabriella, who called you and she gives you full access to their house to start your investigation. As you search for clues, you discover they were not a happy couple and that he was having an affair and that she had found out about it becoming very angry which made her your first suspect. Later, you discover Hugo's affair was with a flamenco dancer named Esmeralda Cortez and that her husband, Carlos, found out about the affair and decided to have it out with Hugo. You now have three viable suspects with a tangled web of jealousy as a motive. Further investigation of the crime scene provided clues on a plot between Hugo and Esmeralda to run off together and that Carlos is now missing. You begin to wonder why stab someone and then blow up the body unless you want to make it hard to identify the remains. Was the one killed really Hugo? You now have four suspects to consider. You need to get to the bottom of this and solve the case. Graphics and animations were well done and typical for 2013 releases with nice colors and sharp scenes. Characters are well presented in this simple but believable jealousy plot that has not been overdone making it feel new. The voice acting is fairly good but may be a little dramatic and the music is looped with spanish style music that became tiredsome, especially the flamenco music. More of an adventure game where everyone has a motive, hidden agendas, a few predictable twists with a linear design and a low level of difficulty, you work through small sections of locations at a time so a map is not provided. There is a journal to store notes and clues and a separate tab for suspects with information on motives and suggested evidence against them recorded. I still don't know why they included your assistant Aidan in the game as all he does is make frequent appearances to state the obvious of what just happened and then leaves. I found him totally useless. The only help provided is through the occasional appearance of Hugo's pet Fennec Fox to nudge you in the right direction. 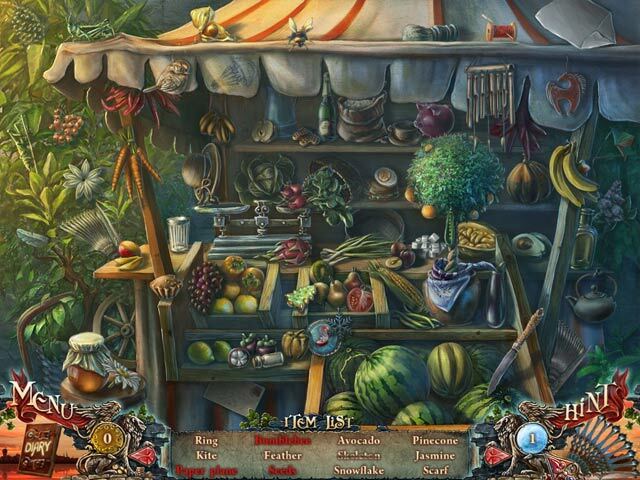 The inventory puzzles and minigames were nothing new and fairly easy and the few hidden object scenes were short interactive lists, silhouettes, and find a certain number of different objects. Something different, at least for me as I have not played the first two episodes, is the finding and collecting coins that are needed to buy items from a store in game that are used in various puzzles to advance the game. None of the coins are hard to find as they are usually discovered after completing a task. Also, there are hand fans scattered throughout the game including the hidden object scenes that increase the number of hints available. One note of interest is that early in the game an important piece of evidence is used to clean a piano and is then thrown away which no self-respecting detective would ever do. Otherwise this is not a bad game and could provide a few hours of sleuthing. Rated 4 out of 5 by Kimmycoo from The cost of awesome games! I loved this one! Graphics Music--HOWEVER I am hoping the game developers will change the music as its getting old, as you guys put the same music in them all. We needs some new stuff!!! Sounds when you find an object or click to go somewhere are old, you guys use these sounds in every game, we need NEW sounds. HOS--great! Most had several things to do in each scene to find the object they wanted you to get. A lot of matching games in this too, a bit too many, but I still liked them. Scenes were really nice, artwork fantastic. Loved the voice overs and cut scenes could have been a bit better. I give this game a 4 stars. Its a long game too for just the standard version and I REALLY LIKE THAT. A lot of games that are newer meaning this is 2015, so stuff thats just come out the games are too short. I recommend this game and all of the other Grim Facade games in the series! Rated 4 out of 5 by deddu from WHO WAS THE KILLER Good Ears game. You gather evidence in a diary and build clues to find the killer. 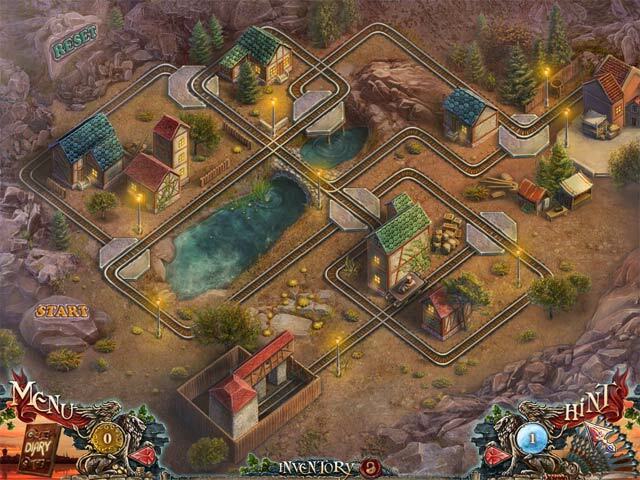 The mini-games are not too difficult and the hidden objects are interactive. 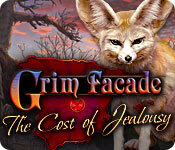 Rated 4 out of 5 by perfume60 from Grim Facade The Cost Of Jealousy I really liked this game, It had lots of different puzzles and things to do which really kept me interested in the game. Graphics were good and that makes a lot of difference. However the ending was really stupid? I wont give this away as it will spoil it for people who want to purchase.I actuallyI thought something had gone wrong with the Game!! Anyhow i would recommend this game definately different. Rated 4 out of 5 by mlw14 from Another great game but a little short Interesting storyline. It keeps you interested in playing because of the theme. Good variation of games. Varying scenery and many areas to explore. A little short. Not as long as needed to be. Rated 4 out of 5 by RevKellie from Great Graphics, Superficial Story Like all the Grim Facade games, this one has beautiful graphics, varied puzzles, fun challenges. The story is weaker that some of the others. Pros: Beautiful graphics, varied puzzles (easy to medium), challenges to earn money for clues. Cons: The new "assistant" is annoying and useless - stating obvious things "Wow, maybe we should go in that door!". The cute little fox just disappears with no explanation, and when you get to the end there's no motivation for the characters to do what they are doing then BAM! It's over. Overall, it was a fun game - but plays like they took 6 months on the first half, and 6 days on the second. Rated 4 out of 5 by catbag8717 from Great Quality. Short Game. Bad Ending. REVIEW OF COMPLETED GAME ‘Cause I liked the trial, I decided to purchase this game on sale, and I really enjoyed it, but I was disappointed in 2 things: 1) The game was very short, even for me 2) The game’s ending wasn’t very good, and looked like it should have continued (This is what the CE is for!) The story was really good though, and was originally what attracted me to the game as I love a good old-fashioned murder mystery. The story takes many twists and turns and has an unexpected conclusion (even if it was an open end) and I really appreciated this story. I also enjoyed the little fennec fox that occasionally popped up from time to time. That being said, I still wasn’t impressed with the length of this story, my estimate being 2-3 hours of gameplay, which simply is not enough. As is custom with the current ERS games these days, there were 2 different types of HOS: Junkpile & Silhouette. Both were good and challenging, with silhouette being the most challenging for me. I found myself constantly using the hint for that! The junkpile HOS features 2-3 extra step objects per scene, with two collectable fans in each scene also. The fans are used for instant hints, which you can use at any time, otherwise you must wait for the hint to recharge. The puzzles were a mixture of good and hard. To my surprise, I was able to complete most of them. There were multiple sucker dart puzzles, which I enjoyed. There were some of the puzzles, for example, the chain puzzle, that I didn’t like though and found to be too hard. One annoying thing that I feel I have the obligation to point out: If you leave the puzzle accidently, the skip button resets and it has to charge again!! The graphics and voice-overs were standard for ERS games these days. Everything was clear and the artwork was well done. Voice-overs were not over-done, luckily, as I cannot stand over-acting. Overall, standard. I can’t complain FEATURES - Diary to keep track of events - No map - Suspect file, which is located in the Diary. Keeps track of suspects, motives and evidence. - Fast recharging hint and skip, although the skip resets if you exit out of the puzzle. There are some fans to collect that give you instant hints. - Collectable coins to buy items. You can find coins scattered throughout the game or win some in the sucker dart game. Overall, I was extremely impressed with the story and quality of this game, but very disappointed with the length. This game gets a four overall, although I give it 5 for enjoyment. Rated 4 out of 5 by b2u4 from Good game Was very nice to play. Nice graphics. HOGS - some easy, some are hard parts. Mini games - I was not always able to play a few - so just used Skip. Did not take away my fun in playing. And sometimes I used Skip just because I didn't want to play the mini-game. - as for audio - i don't know because I seldom if ever listen to the audio of any game. Used to try but the music/sounds became annoying...... - This game will be more fun to some and not as much fun to others but I do suggest that you check out the trial before deciding you don't want to purchase this game. Rated 4 out of 5 by anotherangelkiss from ENJOY!!!! This game was fun with different HO,s throughout the game which is good cuz it makes it so it’s not repetitive and boring. The hit recharges quickly however you do have a certain amounts of hints you can use but not to worry I finish with tons left in fact I only had to use my hints a couple of times. The story line is good. Voice overs were good. The puzzles where good some a bit easy but still fun others were not too hard and not too easy so really good. There is very little back tracking if at all so that was a plus for me. To be honest I really enjoyed the game and if it hadn’t been for the length of the game it would have gotten a 5 star review from me but I found the game to be quite short as I believe I finished in under 3.5 hours and I wanted to keep playing so that was disappointing to me. I wasn’t crazy about the very very end but it wasn’t bad I think part of it is just that I wanted more lol. Well if you want a nice relaxing, fun game to play this is a good one in my opinion so….Enjoy everyone! Rated 4 out of 5 by spearmaiden77 from Beautiful venice! Lovely graphics and setting. Interesting storyline. Level of challenge is about medium but still fun! Rated 4 out of 5 by Jem_Jerrica_Guy from Without the bonus Collector's Edition adventure, The story is not complete. It won't come full circle unless one plays the CE. Rated 4 out of 5 by centauri272 from Good game but weird ending! This game is as beautiful as most of ERS-games. Crisp graphics, good storyline, interesting mini-games... I was happy until the ending... it happens when you don't expect it, and I really didn't like that! Much more, it happens after about 2 1/2 hours...! Nevertheless, as an ERS-fan, I still recommend it. Rated 4 out of 5 by Granny512012 from VERY WELL DONE ONCE AGAIN!! GEORGEOUS SCENES,GREAT MUSIC,GOOD HOS SCENES...IM VERY PLEASED ...WTG DEVS...KEEP EM COMING!! Rated 4 out of 5 by 4red3s from Entertaining I wish that I had waited to purchase this game after I found out that ERS games are on sale. I really enjoyed the game itself. I got the collectors edition mainly for the strategy guide. However, when I got to the bonus game.... I found a glitch. There are two square pieces that go on a suitcase so that it will open. One has a tree and the other has a sun. Be careful, if you place these on the wrong symbols - the squares will be placed but then .... nothing. The cursor remains the viewing only not the hand to pick them up and put them in the correct place. :( Play the game but if you mess up the bonus - you have to replay the game again to unmess up the bonus. - no reset button here :) I recommend the collectors edition if you need the strategy guide like me. Overall the main game was a lot of fun to me. The bonus is not so much. Rated 4 out of 5 by stevedanut from Good game, but . . . . . Really good game, but what is up with that terrible ending??? I had to hit the play button again only to be told I had finished the game! Arggghh! Rated 4 out of 5 by mygames49 from WHAT HAPPENED!!!!!!!!!!!!!!!!!!!!!!!!!!!????????????????? EVERYTHING ABOUT THIS GAME I LOVED, GRAPHIC, VOICE OVER, EVER ITEM YOU FOUND YOU USE VERY QUICK, SO THERE WAS NOT A LOT OF BACKTRACKING, WHICH I DO NOT LIKE. THEN IT WAS OVER, I DID NOT LIKE THE WAY IT ENDED, IT HAS TO CONTIUNED. Rated 4 out of 5 by missgranny from Fun Game Typical ERS game, great graphics, voice overs were good, collect fans for hints, really cute fox to help too. Hint button excellent depending on how many fans you collect.Not exceptionally long but as always with this developer you get your money's worth, clearly defined HOS, nice easy puzzles.The only disappointment for me was the very very abrupt ending.It left me with, What was that!!! I only hope there will be another episode. Rated 4 out of 5 by amminnc from This is a keeper! I only played through the demo, which is why it gets 4 stars and not 5, but will certainly end up buying this one just to see how it turns out. It has an intriguing storyline -- all about murder, jealousy and secrets. So far, interesting but fairly easy puzzle and HOS -- but I played the demo in casual mode rather than the two more challenging levels. So although my review is perhaps making this game sound too easy, the storyline kept my interest. Typical good graphics as we've come to expect from ERS, as well as realistic voiceovers. Nothing annoying that I've found so far. It's a keeper for me! Rated 4 out of 5 by neilskinut from Good and easy Another good grim facade game. The music I turned down. The graphics are real good and has voice over. The HOS are about like all the others. Nothing really new. Hint works good and you have other things to find throughout the game. It is a ERS game so that tells it all. I'm surprised this one came out so soon after the CE. I really was surprised how easy this one was. The flow was good and not that bad taking you all over the place. Good game just nothing really new. Rated 3 out of 5 by mjromano69 from Grim Facade: The Cost of Jealousy I usually don't like to say anything bad about any BF games, but this one made me upset. The game all in all was ok. It was fun for awhile and then it started to slow down. It wasn't very hard as far as the challenge. The story line is what made me upset...The Ending Was Not Expected. Bang...It was over! Nothing lead up to this terrible ending. Don't waste your time. Rated 3 out of 5 by shawnsgrammy from Grim Facade not so great I thought the game play was just OK and the graphics looked like an old game. Fuzzy in a lot of scenes. Would not recommend. Rated 3 out of 5 by pmanuel from Interesting HOG Game pretty well follows the pattern in the two previous episodes. The ending however is abrupt and leaves the player hanging. Rated 3 out of 5 by secretgamer62 from Disappointing ending I am an avid reader of reviews before purchasing a game but normally never write them. 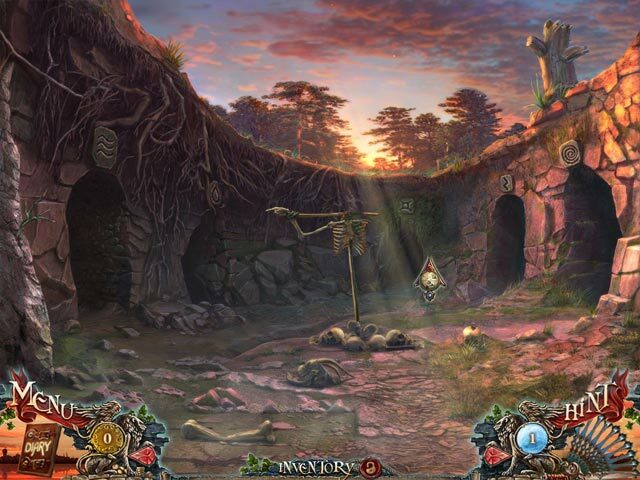 I have just finished the game and enjoyed the storyline, hidden object scenes and puzzles. A little simple but enjoyable nonetheless. I am so disappointed in the ending however. I felt the story was over before it had really reached the climax and thought I had at least another half hour to go. Very disappointing.